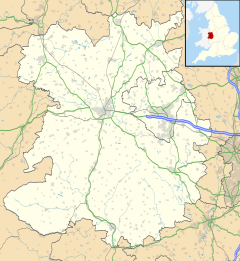 Clive is a village and civil parish in Shropshire, England, United Kingdom. Clive is situated around the west side of Grinshill Hill. Grinshill sandstone, from the nearby quarry at Grinshill is used throughout the village for building material from walls and houses to the village church. The English Restoration dramatist William Wycherley was born at Clive. Clive is situated just off the A49, and the B5476. There is a railway station nearby, on the Welsh Marches Line, at Yorton, between Wem and Shrewsbury. The station at Yorton is served by roughly one train every 2 hours in either direction, and is a request stop. The village is served by bus routes to nearby towns Wem, Shrewsbury, and Whitchurch, giving services 4 to 6 times per day. In the centre of the village is All Saints church  which holds regular services. The vicar is Rob Haarhoff. Clive Church of England primary school is situated halfway up Grinshill Hill. The village is often used by the local Hunt, The North Shropshire Foxhounds, from time to time there are meets around the village. The Post office on the High Street remains a central point for the community, while regular evening classes, from computing to weaving, are held in the village hall. The village is served by a monthly news letter with input from the local community. The village is within walking distance of two pubs, The Inn at Grinshill and The Railway Inn. The village is also served by a mechanics, car dealership, bowling club, village club, and a number of small businesses, such as decorators and electricians, are based in and around the village. ^ "Civil Parish population 2011". Retrieved 24 November 2015. This page was last edited on 18 April 2018, at 17:59 (UTC).